Most tolls * are going up on Easter Sunday 1st April and we are having a protest. It will be from 10 am till noon at our usual spot - the bridge which goes over the Tunnel entrance on Oakdale Road, Wallasey, CH44 7HS. It is Easter Sunday and we realise that most people will have other things to do, but it is the day that they chose to increase the tolls and so is the best day to show that we are against both the increase and the politicians going back on claims that they would reduce all tolls. * Cash tolls for class 1 - which covers cars and light vans - go up from �70 to �80. The tolls for cars and light vans with tags remain at �20 except for those using the Tunnels on Sundays or at night (from 7pm to 7am Monday to Saturday) when the toll will be reduced to �00. All the tolls for classes 2, 3 and 4 are increasing whether the vehicle has a tag or pays cash. MTUA are ordinary users of the Mersey Tunnels that link Liverpool with the Wirral peninsula. We campaign against tolls and toll increases, and take an interest in other issues that have an adverse effect on users of the Tunnels. We had a long bitter campaign against the Bill that became the Mersey Tunnels Act 2004 (Brief summary of the Bill) which made it easier to increase tolls and use toll money elsewhere. We tried to make Parliament aware of what this Bill was about and were hoping that they would not allow it to become law. But it was passed in the Commons on 29th October 2003. It then went to the Lords and we petitioned the Lords Committee, but the Lords passed it on 28th June 2004, by 75 votes to 65. We have fought against each toll increase. The best that we can say is that we believe that were it not for our efforts then the increases would have been bigger and sooner. Over the last ten years each ten pence increase in tolls that we have helped to stop or delay would have amounted to about 500 pounds. Though it now seems clear that Merseytravel are after the full pound of flesh that they were given by the politicians at Westmeinster in 2004. This is partly because they are in greater need of money to finance their pet projects and partly because they are allied with those behind the scheme to build a Mersey toll barrier from Liverpool to beyond Runcorn, and they want all the Mersey tolls to be as high as possible. We have at various times submitted to Merseytravel proposals that would benefit both tunnels users and the local economy in Liverpool and on the Wirral. The proposals required no contribution from local or national taxes, but each time, Merseytravel rejected them. 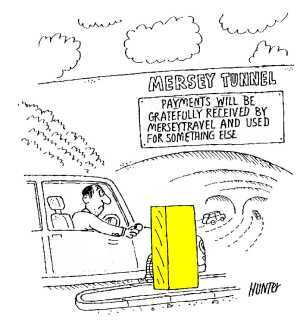 Previous ones were at the start of 2006, "Mersey Tunnels - Another Way Forward" which were rejected at a meeting with the press and public excluded. And in Autumn 2004 - "A New Way Forward For Tunnels"
The 2004 proposals were backed by local MPs including Frank Field, Stephen Hesford and Bob Wareing, by the Leader of Liverpool City Council (Mike Storey), and by Lords with a local connection including Lord Alton of Liverpool, Lord Chan of Oxton and Lord Hunt of Wirral. They were also backed by the AA Motoring Trust, the Forum of Private Business, the RAC Foundation and the Road Haulage Association. The subequent proposals from us met with almost no support from local politicians, though as Merseytravel not only ignored support for the Autumn 2004 submission, but also increased tolls from April 2005, it seems that the views of MPs and others did not carry any weight with Merseytravel.